Today’s word, Streakers, is CHALLENGE. … As in, America has never faced one she couldn’t overcome. … As in, I bet you can’t eat those six hot dogs in two minutes. … As in, the BTS Report is throwing down its red, white and blue batting glove and preparing for fisticuffs. In the far corner: Mr. Stephen Colbert — host of Comedy Central’s Colbert Report, self-proclaimed leader of Colbert Nation, 2008 presidential candidate and inspiration for one of the most American substances to ever grace a 473-milliliter carton. Here’s the deal, Steve-O: Starting today, we’ll be making a daily Colbert Challenge pick — one player per day who we’d risk all our marbles, pogs and Pokemon cards on. You do the same. We’ll go head to head for seven days, resetting every Monday. Can you beat us? Unlikely. But just to make things interesting, we’re offering up a little incentive. Post a better record over any one week, and the keys to the social media juggernaut known as @MLB are yours for a day. 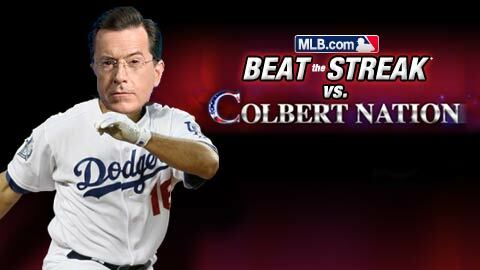 Seven days, seven picks, Colbert. You beat us, and you get 24 hours with @MLB‘s 1.2 million followers. You want to tweet about baseball? Go ahead. You want to tweet about politics? Be our guest. You want to tweet out Thor 3D spoliers? Well, start making picks. We’re locking in Andre Ethier for today. Streakers, encourage Stephen to make his pick known before lock time at 7 p.m.
Jmtribe begins this week as king of the castle with 28 games under their belt. One more day to get over the half-way hump, buddy. You might be able to do it! Anyone here still think that Jeanmar Gomez is playing BTS? FYI: Of the Top2500 today, 88 picked known DL/AAA players. I took Placido Polanco to get to 14. Highest no selection is on page 2 with a streak of 17 now going back to 0. Highest “No Selection” 😛 pg# 2 with streak of 17 back to zero. Yesterday’s Top2500 Reset rate was 29.11% with Lance Berkman reseting the most. And with Miggy’s groundout (0-4 1 BB), we’ll have a pair of new leaders atop the leader board tomorrow, unless DET gets 4 extra batters to the plate in the 9th to give him 1 more AB. Score is 10-2. Well Dave, in your challenge to Stephen Colbert, at least you went outside your top 5 picks (spicy one too) for today: Crushin’ Russian didn’t play. Polanco & Hunter hit, Youk & Helton did not. Though your “you’ll thank me later” picks were golden…. Howie came in game in 5th & will get just 1 AB. But the other 3 picks all got hits within 1st 2 ABs. For your contest you may want to rely heavily on the lefty, i..e, Ethier, Ichiro, Cano, Votto, Damon? Kendrick can get 2 AB’s if the Angels get just 3 baserunners over the next 4 innings. Yep, LAA losing big, so will bat in 9th. Needs just 1 extra hitter now for another AB (0-1). Only 13 of the Top2500 picked him, but those 13 are crossing some fingers right about now. BTS gods were merciful today, for a change. The ex-leader would disagree. And if it weren’t for extras in BOS, Pedroia would have been 0-fer. Can that offer to broadcast to 1.2 million fans extend to us bloggers too if we beat you Dave? Also, LaVolpe, did you find any free/pay sites where I could find the double/triple splits I was looking for? If not, is it possible for you to write a program that would glean every AB for every active MLB player from the MLB.com database and sort it that way? 1. In order to write such a program, one would need access to all those details. Granted I could write something that would parse all the gameday accounts and build a mini database of sorts. But I wouldn’t do that for several reasons: a) extremely time consuming to download that information and b) MLB would probably ban me from their servers for hitting their site too often and too fast. Ultimate success game-days (USGD): On an USGD, all 15 selections get hits or 14 out of 15 get hits and the 1 who doesn’t is a pause. Semi Ultimate success days (SUSGD): On a SUSGD, at least 14 of the top 15 most selected players must get a hit or pause. A SUSGD will occur on any game day that fits the SUSGD rules but not the USGD rules. IF there is exactly 1 O fer and/or 2 or more pauses in the top 15 that game day is a SUSGD. Super success game-days (SSGD): On a SSGD, 12 or 13 of the top 15 most selected picks must get a hit or pause. If there are exactly 2 or 3 O fers in the Top 15, that makes for a SSGD.